OFFICE LOCATED ON WEST SUNRISE BLVD, 2 TRAFFIC LIGHTS WEST OF UNIVERSITYDRIVE & 1 TRAFFIC LIGHT EAST OF PINE ISLAND RD. TURN NORTH AT LIGHT ON LAUDERDALE WEST DR. BUILDING IS LOCATED IN PINE ISLAND COMMONDS PLAZA. FIRST BLDG ON THE LEFT. LOOK FOR CLEARLY MARKED ENTRANCE AROUND THE CORNER. BUS ROUTE 36 RUNS EAST AND WEST ON SUNRISE BLVD. PLEASE DO NOT GIVE OUT ADMISTRATIVE PHONE NUMBER. The Plantation Social Security office is located in Plantation 33322. The following page includes information for this location like the office phone number, hours of operation and driving directions. If you have any interests or comments about your retirement benefits or are interested in making an appointment, call the following Plantation Social Security office. The Plantation Social Security office is located in Plantation 33322. The following page contains information for this location like the office phone number, hours of operation and driving directions. 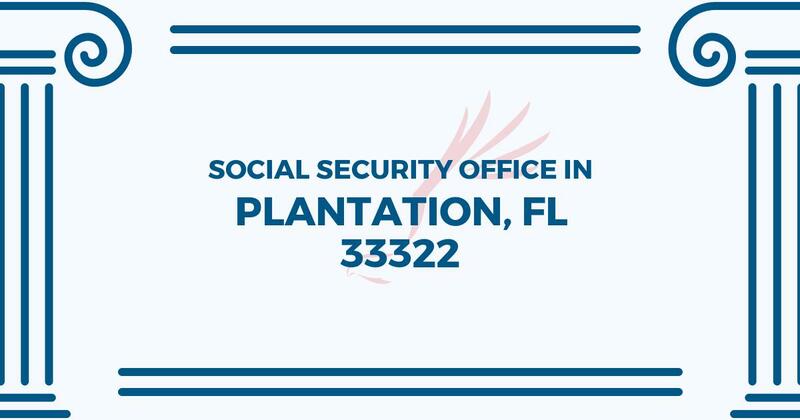 If you have any curiosities or issues about your Medicare benefits or are interested in planning an appointment, call the following Plantation Social Security office.